Loyalty programs are structured marketing efforts that reward, and therefore encourage, loyal buying behavior — behavior which is potentially beneficial to the firm (Wikipedia). Loyalty Programs in the Philippines are everywhere. It is one battleground to retain the fickle-minded customers in the market. Yet, the explosion of Loyalty Programs leave a big vacuum for more learning that companies can use to leverage their products and services “STICKINESS” to the heart, mind and wallet of the customers. This is the Raison d’ḙtre for introducing the LOYALTY CONFERENCE AND EXPO (LOYALTY CONEX) - an effort to provide a platform that will give the necessary tools of learning to the companies on how to WIN CUSTOMER LOVE in the harsh market that prevails in our time. Brand Managers, Social Media Managers, Marketing Managers, Sales Managers, Customer Relations Manager/Officer, Frontline Managers/Officers, CEOs, Entrepreneurs, Academes, Loyalty Consultants, Loyalty and Rewards Officers/Managers, CRM Officers/Managers, Management Consultants, Retail Companies, Service Companies, Banks and Finance Companies, Hospitals, SME Companies and individuals who wanted to learn, win and maintain customer loyalty. CRM Solutions, Marketing Automation Software, Apps Developer, Reward Programme Specialists, Customer Analytics Software, Loyalty Consultants, Brand Consultants, Data Mining, Business Intelligence, Retail Companies, Bank and Financial Companies, Telecommunication Companies, and other companies and individuals that wanted to promote to the event specific attendees. · Ms. Yayu Javier, President and COO, Avanza Inc.
· Ms. Juliet Mabanag, Manager, Customer and Retail, Center for Leadership and Change, Inc.
As an attendee assigned to create or implement a Loyalty and Rewards program you need inspiration. In this event, you will meet industry leaders. 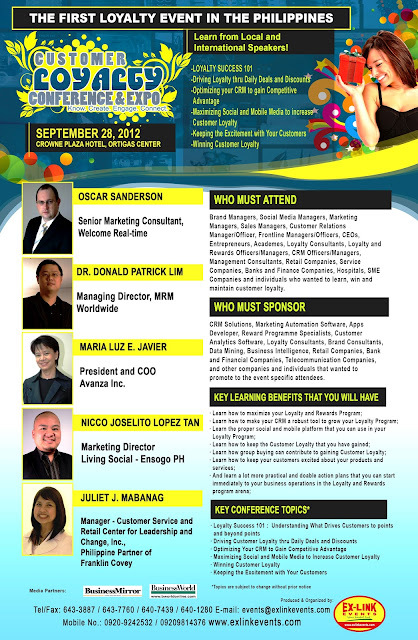 These industry leaders will share to you their knowledge and success secrets. This point of exchange is where you will generate your inspiration and rekindle the fire in your belly to keep moving and keep pushing to add value to your organization by maximizing the knowledge you gained from these industry leaders. Attendees are people that are like you passionate about winning customers and implementing a successful loyalty and rewards program. There is no doubt that during the course of the event you will find someone among the attendees that are fit to be your partner. This is a leverage that you should not dare miss during this one day event. In this fierce age of business competition, you need to also have the edge. Winning customer loyalty will ensure that streams of income and growth will always be at the side of your company. 1. Cancellations seven (7) days before the seminar will not be honoured. 30% of the total amount will be charged to your account if you fail to inform us of your cancellations before the seven-day deadline. Cancellations should be in writing and emailed or faxed to us. Seminar participation may be transferred to another person in the same company. 2. This reservation form, when completed, may also serve as your billing invoice. 3. All seminar fees must be prepaid. * For more than 2 pax, kindly add more. Thank you. last minute changes in case of emergencies (ie. weather, speaker changes, etc). * Please reconfirm your reservation if you do not receive your billing or any confirmation thru email, call and SMS from us. [ ] By Cheque. I will send check payment to your office on ____________________. [ ] By Pick-up. Please pick-up our check on _______________________ (time/date). Made payable to Ex-link Management and Marketing Services Corp., Inc.
Company Name: Ex-link Management and Marketing Services Corp.
[ ] By Credit Card. For zero rated or VAT exempt companies, please include your Certificate of Exemption. Provide Form 2307 or Certificate of Tax Withheld if payment done with tax withheld. Please withhold only 2% as we are classified as suppliers or contractors of services. Attendees of the Loyalty Conference and Expo are already sold on the value of your offerings. They know what you offer are important in making their loyalty and rewards program successful. Therefore, it will be easier to convince the attendees to try your products and services. Partners to distribute your products and services are very much present in the event. This is the best opportunity for you to add new partners or get partners inside the event. Why? They already know how to offer your products and services because like you they know the importance of Loyalty and Rewards Program. The Loyalty Conference and Expo is the first gathering of such in the country. It is the best way to show your presence to the market that knows and are looking for companies like yours. As a sponsor, you will be investing right and you will get your money’s worth because this is the only event tailor made for your products and services.